First off.. 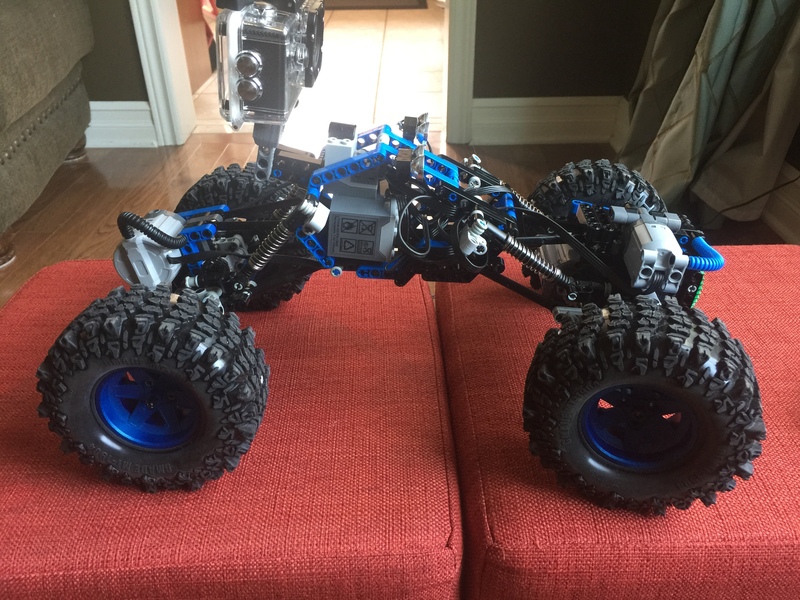 I want to give a shout-out (and credit) to PunkTacoNYC as BluCrawler is based off his Chilli Crawler – this is his creation. I’m just taking it down another path. 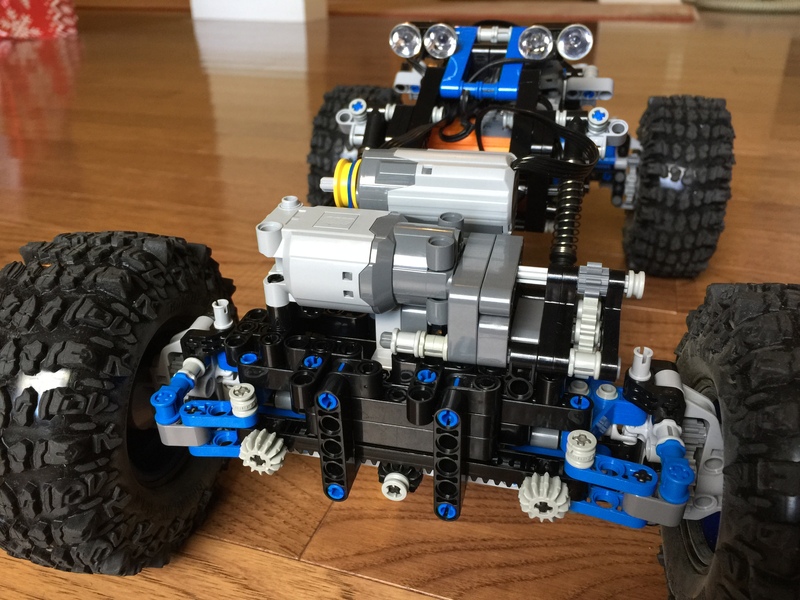 You can also find published instructions if you want to build it yourself. 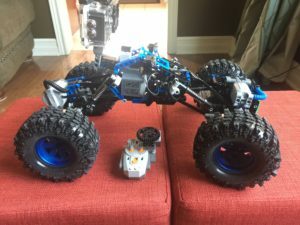 For some time, I wanted to get an RC crawler, but they can be $$$. 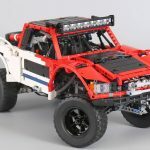 When I came across PunkTacoNYC’s Chilli Crawler, that was it.. 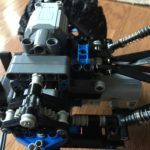 I figured I had 90% of the parts already in my Technic/Mindstorms collection, so off to Bricklink I went… My version is pretty much the same except that I only had the LEGO PF remote and IR receiver (he uses Sbrick). 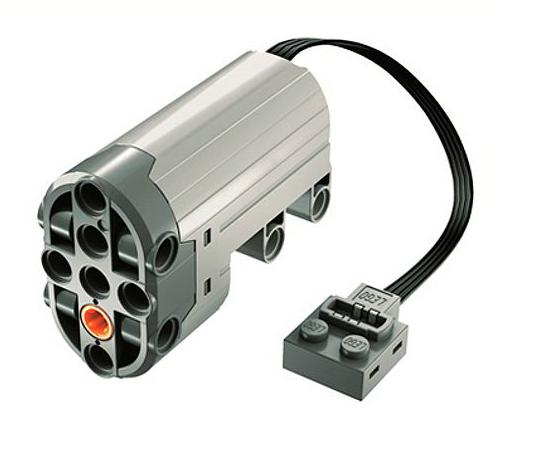 The issue is that the LEGO IR system requires line-of-sight between the remote and receiver. Not very good.. So, I decided to do something about it. Pop over to my write-up of BTBox for more on what I came up with. Note: This is an active project. I’m making regular changes and updating this page, so keep checking back for updates. Links: Connecting links would disconnect from the ball joints during extreme climbing, or stress. 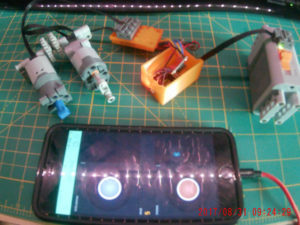 Steering – the current design uses a M-motor and it drives in either direction based on the joystick. I’d often find myself going too far and grinding gears. I wanted to try the servo so motion would be automatically limited. 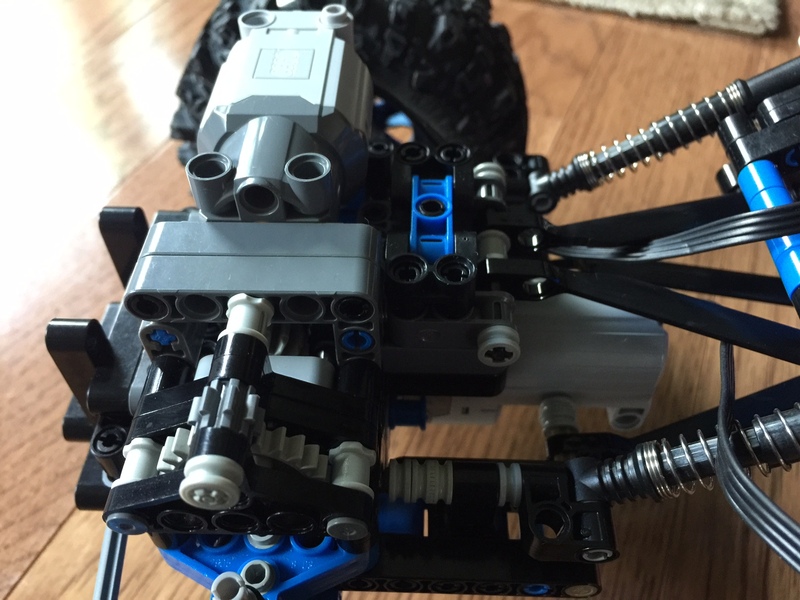 Steering Portals: The original front unit that used a combination of pieces that resulted in more play than I wanted. 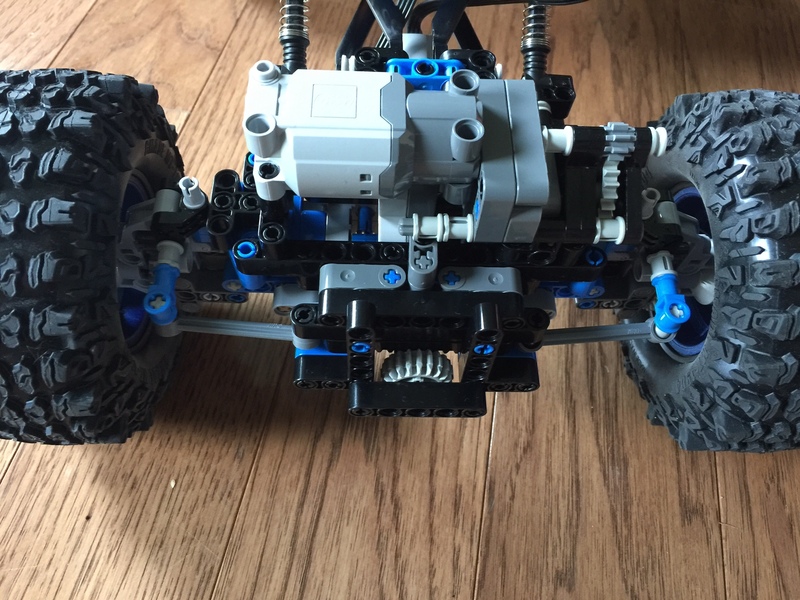 I wanted to integrate the same steering portals that the back drive unit was using. Motors – The XL motors are ideal for this build, but I wanted to try to see if L-motors would do (when geared appropriately). 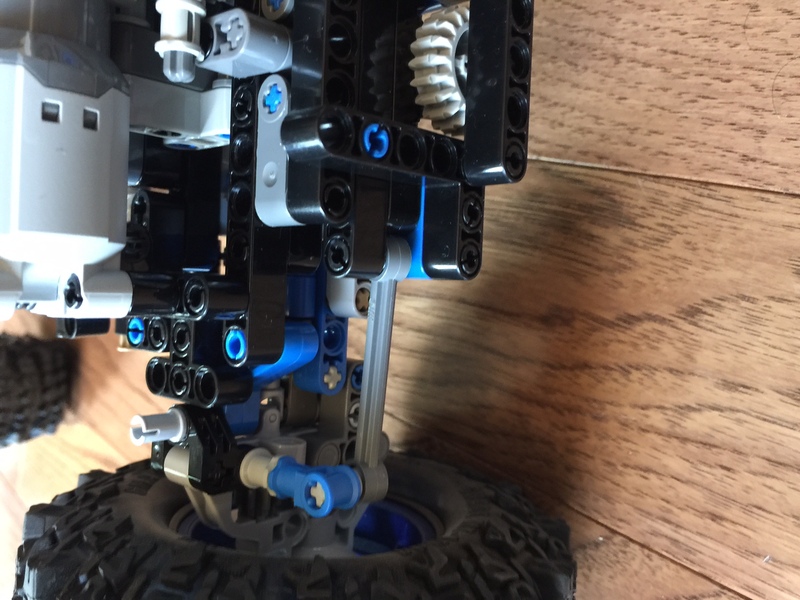 Links: I’m now using Technic Wishbone links which allow direct connections (was using these – part #32293, but they constantly popped off under stress). 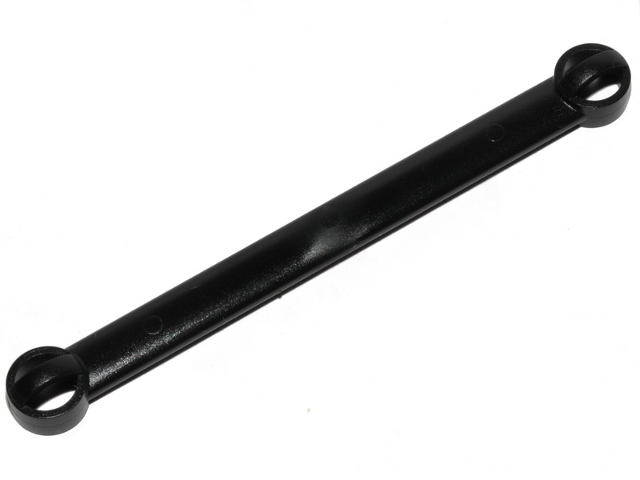 It comes at the expense that there is less side-to-side torsion movement range – but this is buffered by allowing space for the link to slide along the axle. 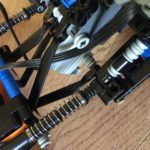 Technic Wishbone links connecting the chassis to the drive units. I’m onto round 2 for steering. 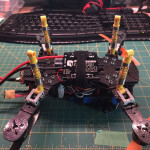 Per below, I decided to try a servo motor. 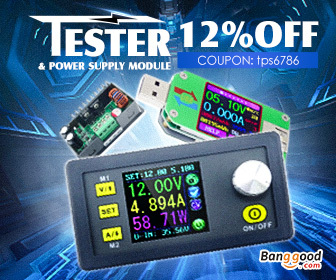 The result was ok, but there were few issues. Namely that the throw was not sufficient. 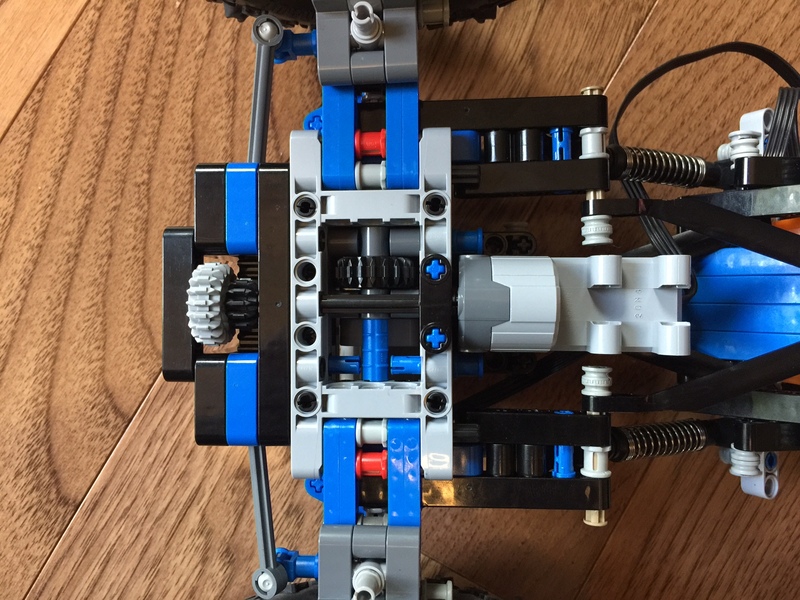 I mitigated this by completely re-building the front and back units as mirrors of each other – both with servo steering. This worked better, but still didn’t cut it. 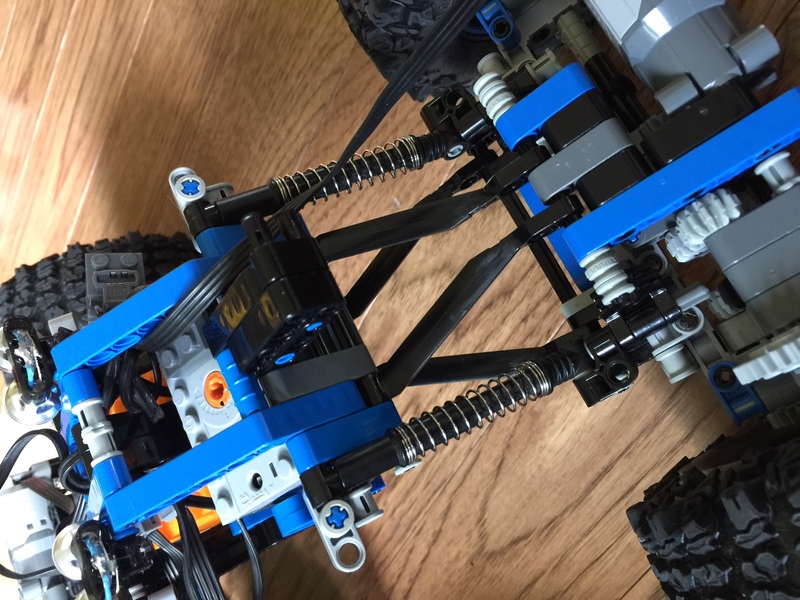 The servos were simply not powerful enough for the forces being put on the crawler as it went through obstacles. 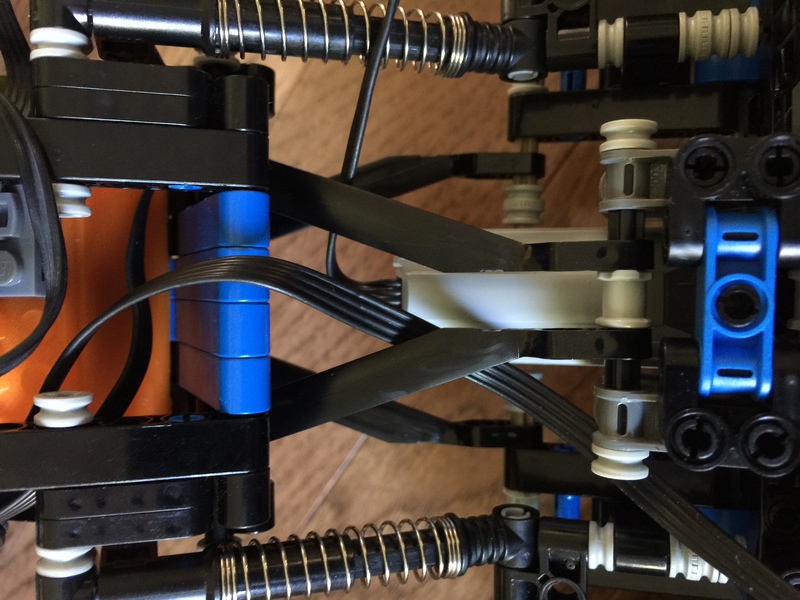 I ended up going back to a direct drive approach with a LEGO M Motor. 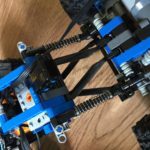 I also was challenged with mounting and wanted something that could drive the gears and forces, but not cause something to break if I drove the motor to extreme ends. 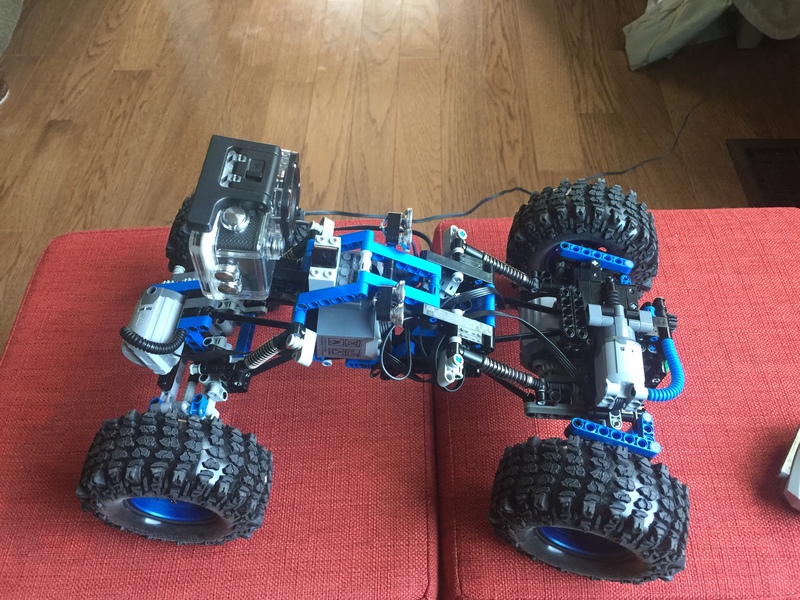 I decided to use a LEGO elastic drive approach. To my surprise, it’s working quite well. It looks odd, but it works. I get the thrown needed. I was considering again mirroring the front and rear but would run into trouble if one of the motors slips out of sequence. This gives me another idea I may look at for BTBox. Getting into integrating some sort of sensor input. 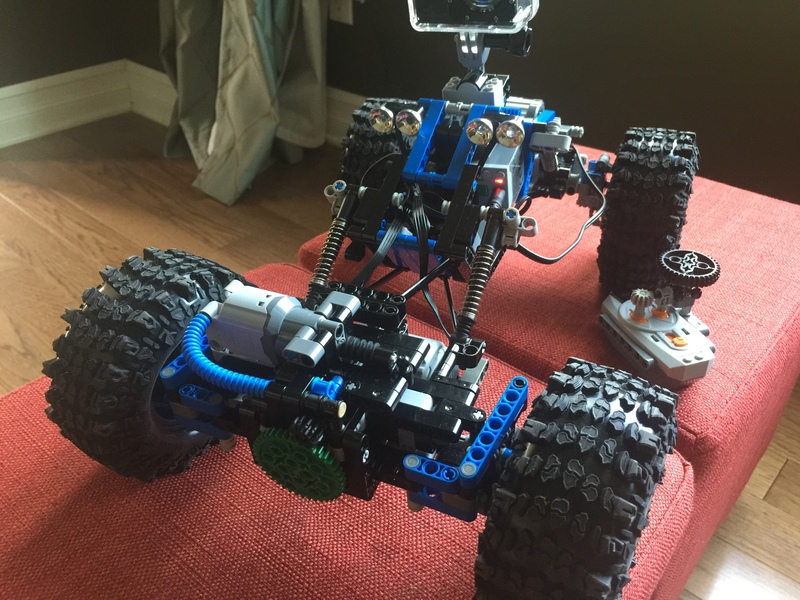 Something like taco counters like a servo would use which would allow me to keep the steering in sync. Sort of like a servo. Anyway, that’s a Winter project. I’ll update if I get around to doing it. Old: My adventure to modify the steering resulted in my completely rebuilding the front unit. 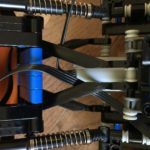 The goal was to integrate the Servo Motor into the design. The challenge was where to put it. 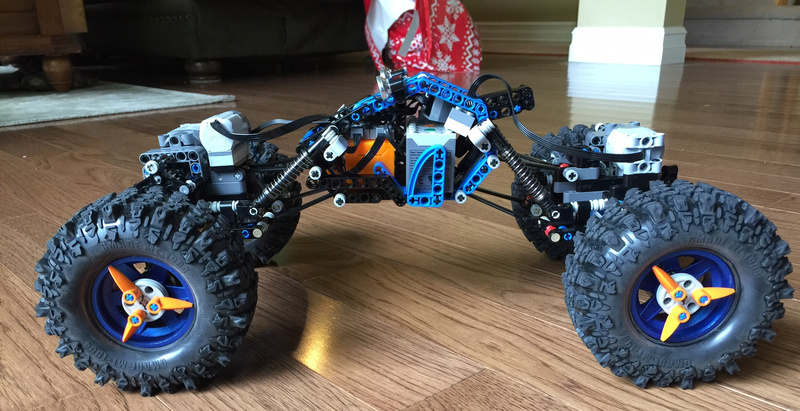 I ended up using the space where the XL motor was from the previous design. 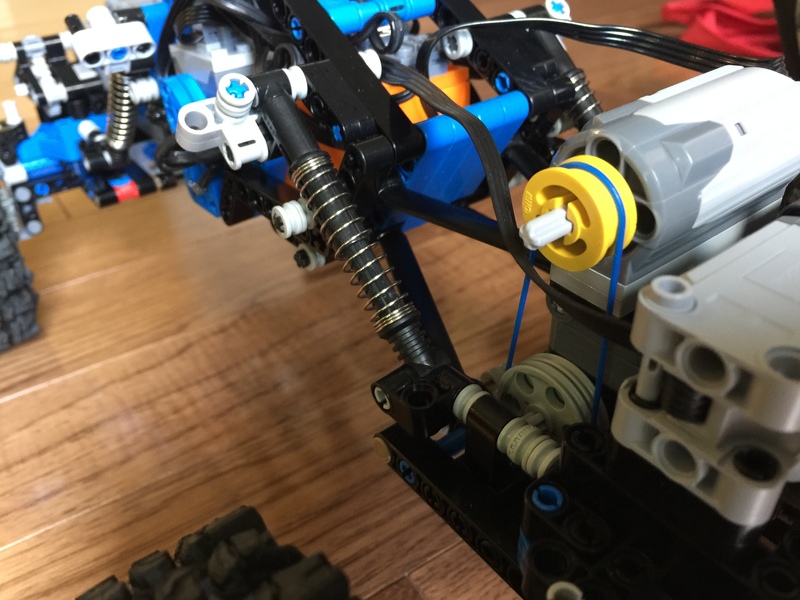 For the drive motor and gearing, I used a similar approach from the original but with a different combination of gears to allow the lower torque ratings of the L-Motor handle things. 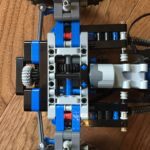 I also managed to create a means to easily swap out gear ratios. The current setup has a geared down ratio but allows me to use either a 8 to 24 (3:1) or 16 to 16 (1:1) gear set depending on the terrain. 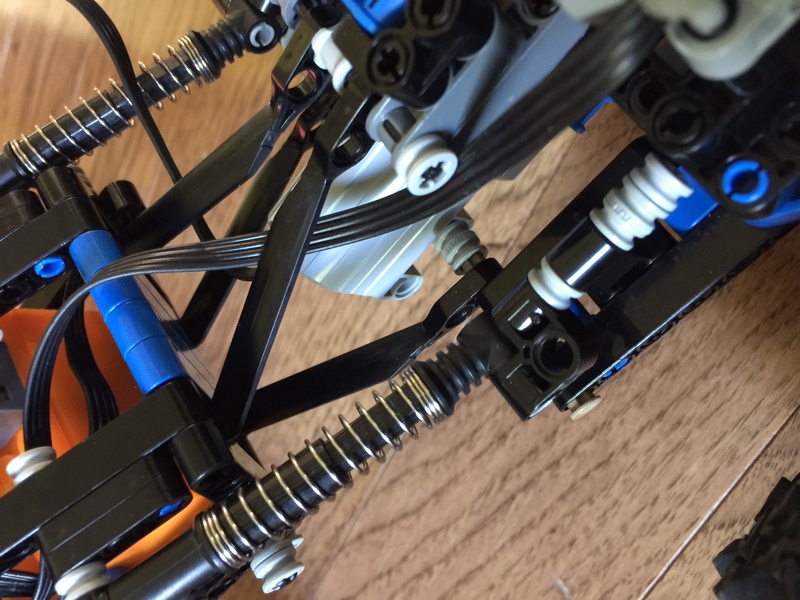 I also replaced the original steering arm components with Technic Steering Portals. 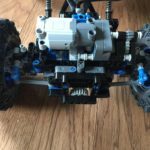 Result is a stiffer front drive unit. I’m using the Blynk app on my phone to remotely control BluCrawler using my custom motor controller that I call BTBox (more here). 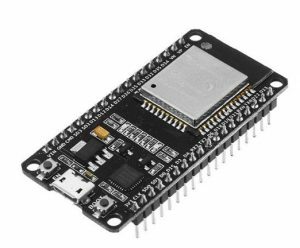 Lots of detail is at the link, but in short, I wanted to build a custom motor controller that I could use with Blynk apps and write my own sketches against. 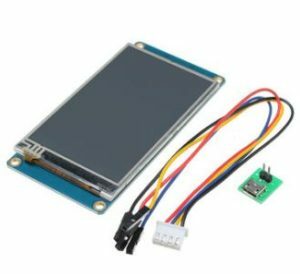 I’m already looking at a future version that has sensor inputs as well as things like light control etc. 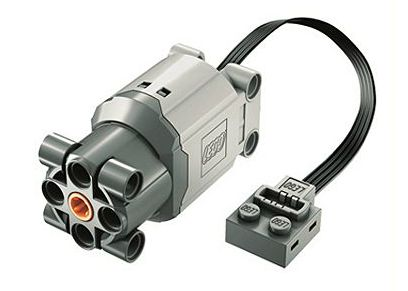 You could easily use a SBrick, or BuWizz or even the LEGO PF IR Controllers as well. 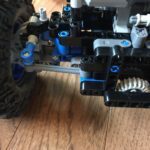 If you want to build BluCrawler, I’ve included the LXF files. 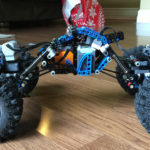 Not all parts were available in LDD. Also, there were some alignment issues that would not allow me to mount certain pieces. This is evident in the extra parts I’ve shown in the video’s above. Their placement should be self-evident. 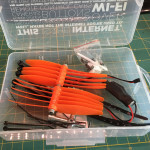 There are 2 L-Motors and 1 M-Motor. Also, the shocks I use are black (soft spring). You can follow the links above to PunkTacoNYCs original Chilly Crawler if you like as well. 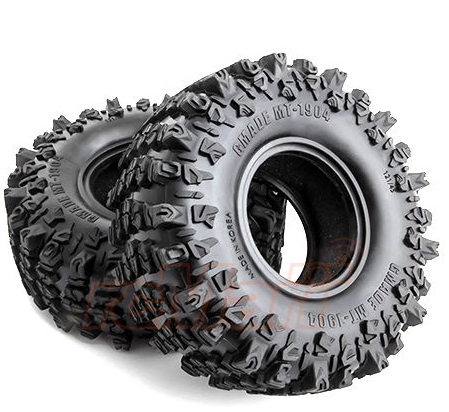 Tires are GMade 1.9 Off Road Tires (Gmade MT1904 Off Road Tires 1.9 Inch Wheels EP 4WD 1:10 RC Cars Crawler #GM70304). They can also be found here. 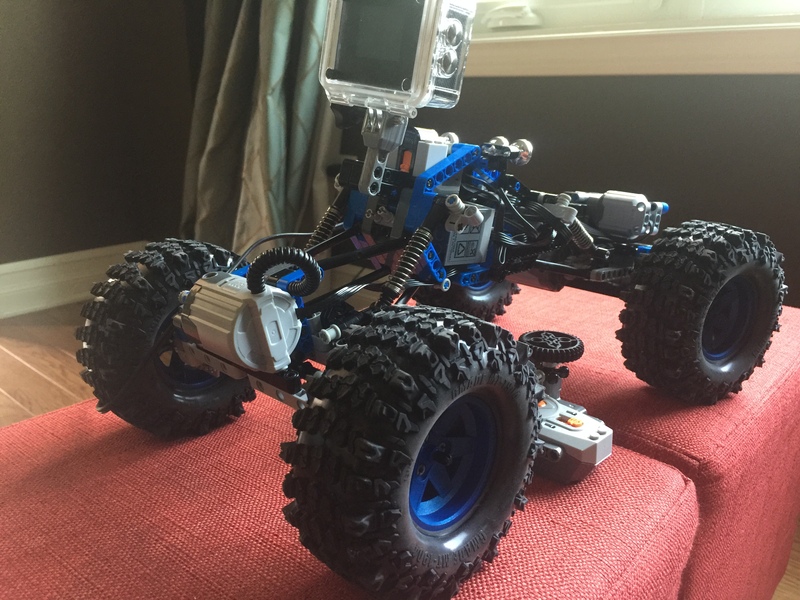 Below is info and videos of the original version of BluCrawler – based on PunkTacoNYC’s Chili Crawler. 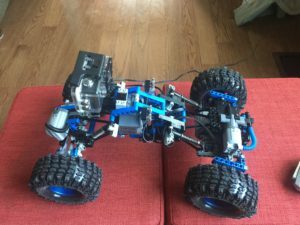 Hello, this BluCrawler looks awesome and I am in the process of rounding up the parts to try and build it. 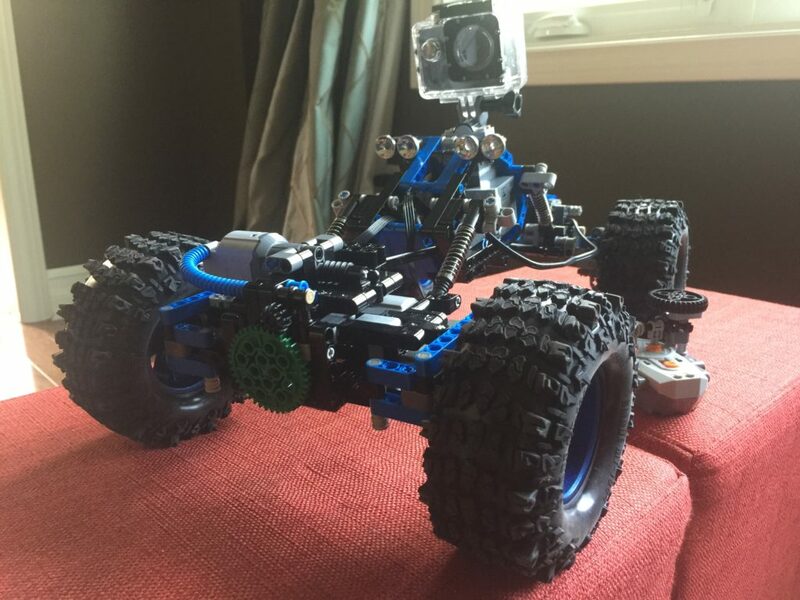 can you advise how you mounted the RC tires to a LEGO wheel? Which wheel part # did you use?